Here's what could go right for this credit-card issuer to send its stock higher. In 2014, General Electric spun off its in-store credit-card division, Synchrony Financial (NYSE:SYF), in an IPO as part of its plan to wind down the company's large finance division, GE Capital. Since the IPO, Synchrony's stock is up 26%, but it sits today 19% below its all-time high from July of 2015. What will it take for Synchrony Financial stock to return to that all-time high and beyond? I think these three reasons are all enough to send the stock higher. 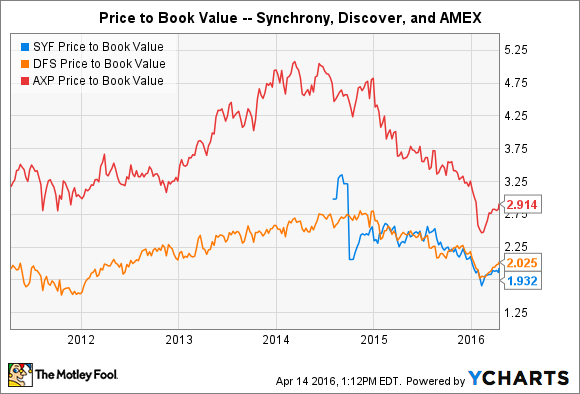 Since the 2014 IPO, Synchrony's stock has been valued roughly the same as Discover Financial Services (NYSE:DFS) in terms of price-to-book value. Today, Discover trades at 2.0 times book value to Synchrony's 1.9 times. The market values American Express (NYSE:AXP) at a premium to both of these competitors at 2.9 times, though that value has declined significantly during the last two years. SYF Price to Book Value data by YCharts. In terms of return on equity, the correlation between these stocks seems reasonable. As of year-end 2015, American Express led both Discover and Synchrony in returns on common equity at 24.5%, beating Synchrony by 22% and Discover by 14%. Higher return on equity should yield a higher valuation. That makes perfect sense. However, the market may be ignoring Synchrony's growth rate, which to me is a large differentiator between the three companies. Since 2013, Synchrony has grown its total assets by 42%, far more than Discover's 9.6% growth and American Express' 5.1%. During the same period, Synchrony's annual revenues have jumped 6%, to 4% and 3.1% for American Express and Discover respectively. 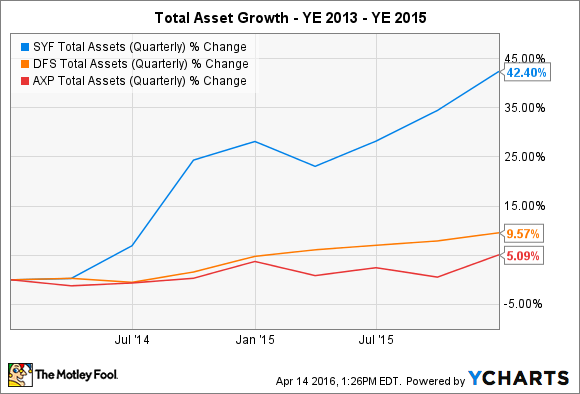 SYF Total Assets (Quarterly) data by YCharts. Synchrony's fourth-quarter purchase volume increased 8% over 2014's, largely driven by a 23% increase in online and mobile orders. Loan receivables jumped 11%. Based on Synchrony's valuation today compared to Discover and American Express, it's possible that the market underappreciates Synchrony's growth rate. If that's correct, its valuation could jump ahead of Discover, causing the stock to rise along with the company's assets, customer base, and revenue. Consumer credit balances in the U.S. have increased for 54 consecutive months, as of the most recent data available from February of 2016. In February, this growth beat expectations with a $17.2 billion increase. The January figure was also upwardly revised to $14.9 billion. Revolving credit increased $2.9 billion for the month. U.S. consumers are borrowing like crazy, and they have been doing so unabated for well over four years now. That's a fantastic trend for credit-card companies like Synchrony, and forward-looking data indicates the trend is likely to continue. The New York Federal Reserve Bank's Survey of Consumer Expectations indicates that households currently expect to increase their spending over the next year more than projections for increases in wages. In February, the Fed found that consumer expectations for spending increased 1% versus just a 0.3% increase in expected income growth. Another survey by the Fed, the Survey of Credit Access, found that credit-card applications are likely to increase this year, providing support that credit cards will be the funding source of choice for any increase in consumer spending. Taken together, these surveys indicate that households plan to increase their spending more than increases in their pay, and credit-card debt is the most likely funding source to fill that gap. These are just projections, though, so reality could play out differently. However, the implication for the entire credit-card industry is important. A rising tide lifts all boats -- in this case, to the benefit of Synchrony Financial, American Express, and Discover Financial. Synchrony's efficiency will give it a strong competitive advantage. A bank's efficiency ratio measures the ratio of its net revenue to its costs. A lower efficiency ratio represents a more efficient bank, meaning that it takes fewer costs to generate the bank's revenues. By this measure, Synchrony is a clear market leader. The bank's efficiency ratio in 2015 was 33.5%, well below American Express' 58%, and Discover's 41.4%. What this means in practical terms is that Synchrony does a better job than its competitors turning every dollar of its revenue into profit. This gives the company more breathing room to invest in strategic initiatives for growth, return capital to shareholders, and even lower the company's risk profile. It allows the bank greater flexibility in pricing, and improves its competitiveness in the marketplace. If Synchrony can maintain this efficiency over the long term, I think it will provide the bank with a major competitive advantage. That should drive strong fundamental performance and push the stock higher year after year after year.